Indulgence in another lovely baked bundt cake. I wanted something lemony and chocolate flavour. A citrus tangy and chocolate flavour all in one ! Ta da ! ... a Lemon Chocolate Swirl Bundt Cake ! The tangy aromas filled the kitchen as it baked. Makes one 6-cup Bundt pan or one 8-inch cake pan. 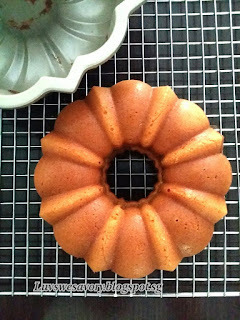 Grease the 6-cup Bundt pan lightly with some *vegetable oil using brush or with kitchen towel, set aside. In a small cup or bowl, mix the cocoa powder with hot water and set aside. In a clean mixing bowl beat together the butter, castor sugar, and salt until light and fluffy using an electric mixer on medium speed. With the mixer on low speed, add alternately the ingredients (B) & (C) starting with B (flour mixture in three additions) and milk + lemon juice (in two additions) [starting and ending with the flour mixture]. Mix well until just combined for each addition. Lastly, stir in the lemon zest till just incorporated into the batter. Scoop about 1/3 lemon batter to a bowl, mix in the cocoa mixture well with a spatula. 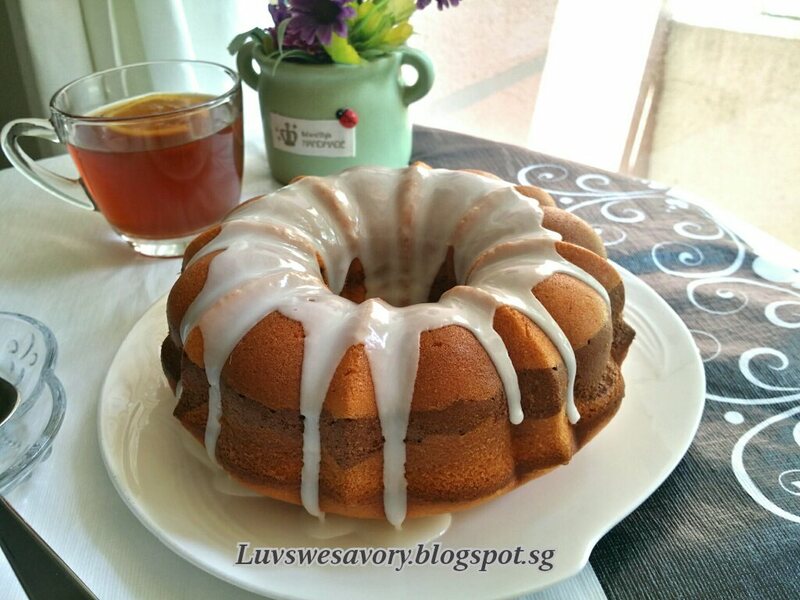 Pour half the lemon batter into bundt pan and smooth the top. Next, spoon all the chocolate batter. Spoon the remaining lemon batter and level the top with a spatula. Tap the pan lightly on a table top a few times to get rid of any trapped air bubbles in the batter. 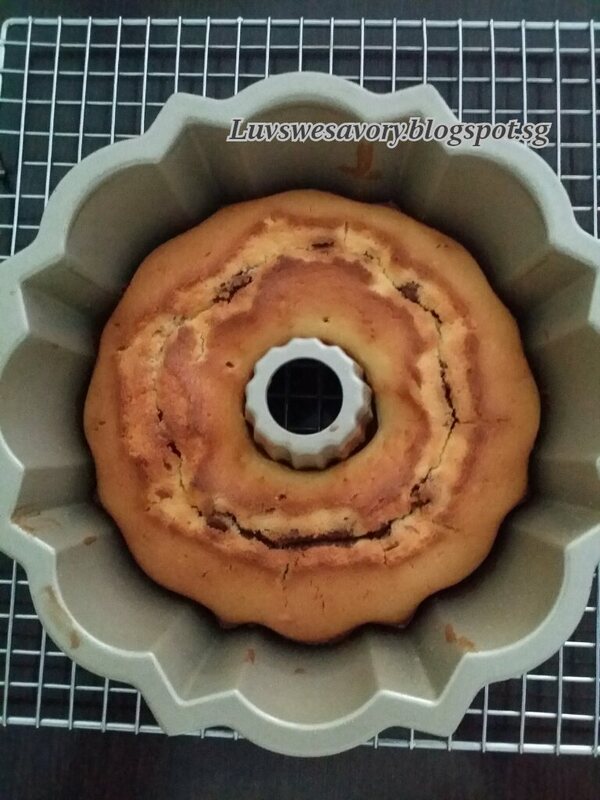 Bake the cake in preheated 170°C oven for 40 to 45 minutes. Check for doneness, insert a skewer in the center if it comes out clean with a few moist clumps clinging to it. Do not over bake else it will be dry. 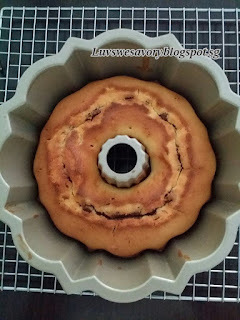 Let the cake cool in the pan for about 10 - 15 minutes and then invert onto a rack to cool completely. 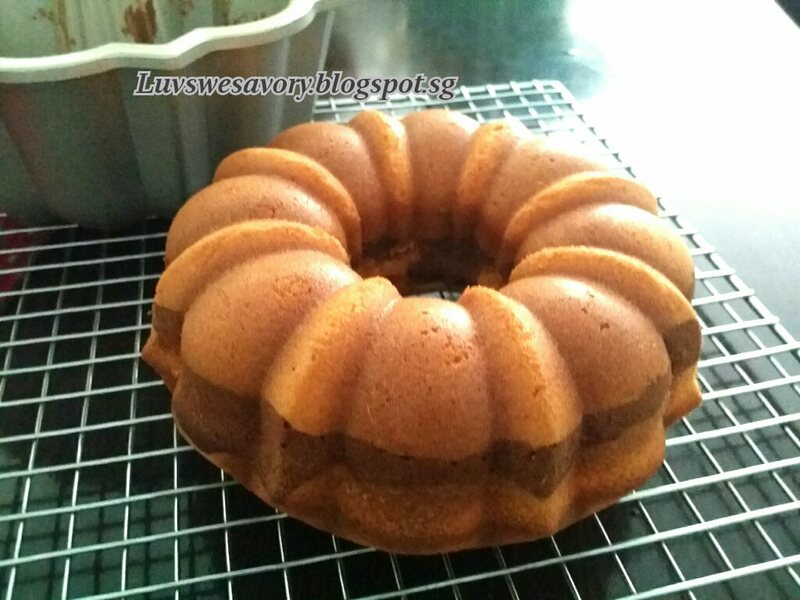 Once cooled, carefully lift the cake onto a serving dish or platter. In a bowl, combine the sifted confectioners' sugar with the lemon juice. Stirring and mixing constantly with a spoon. Start with 2 tablespoons of lemon juice. Adjust the consistency to your preference by adding more lemon juice or confectioners' sugar accordingly. Use a spoon to drizzle the icing over the top of the cake and allow it to fall down the sides. Let the icing set for a couple of minutes before slicing the cake. Love the texture ... like a light pound cake not too dry or too dense. 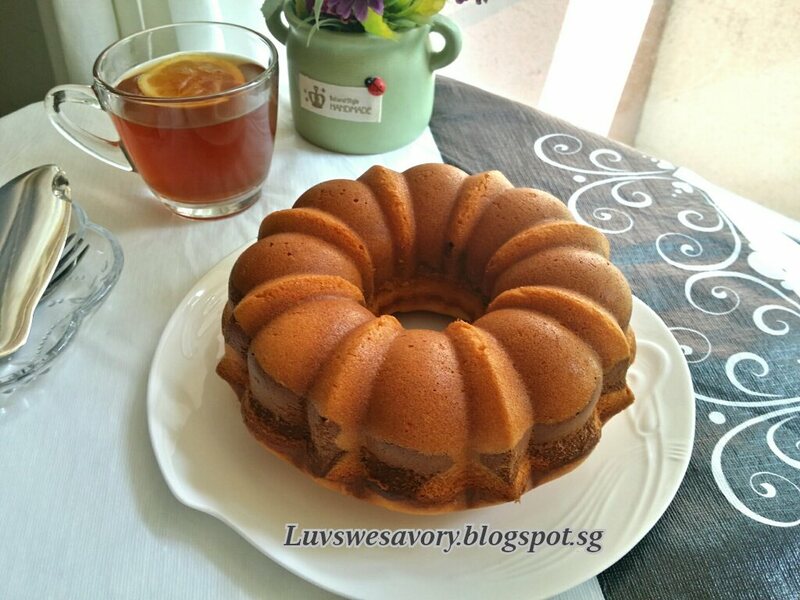 Love this simple yet gorgeous lemony chocolate flavour cake with fine tender crumbs. 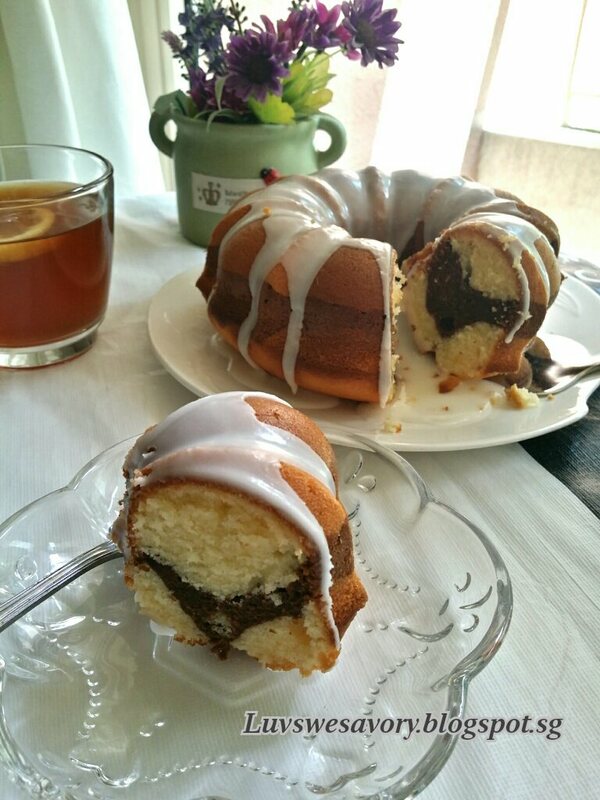 Enjoy our weekend afternoon break with a slice of lemony and chocolate swirl flavour cake. 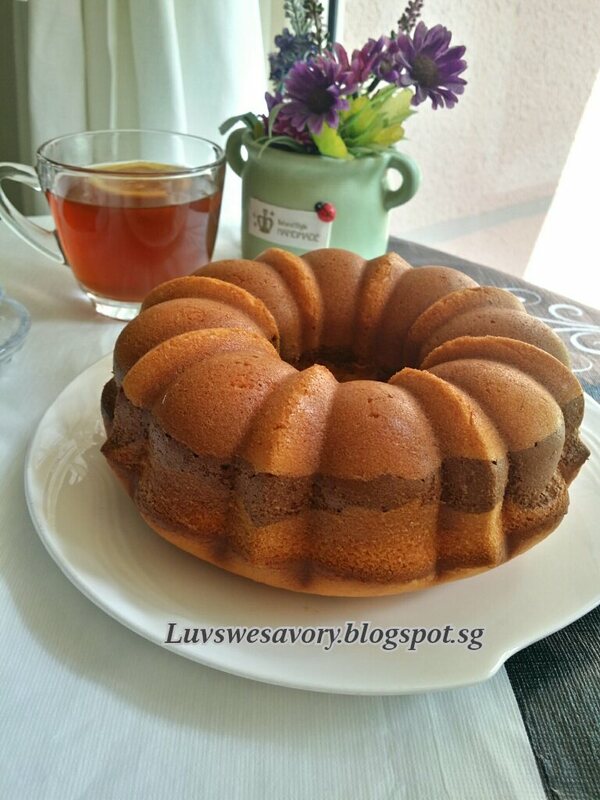 Perfect with a cup of warm honey lemon tea. Karen, that is so beautiful! I never thought chocolate and lemon flavors go well together. I must try! 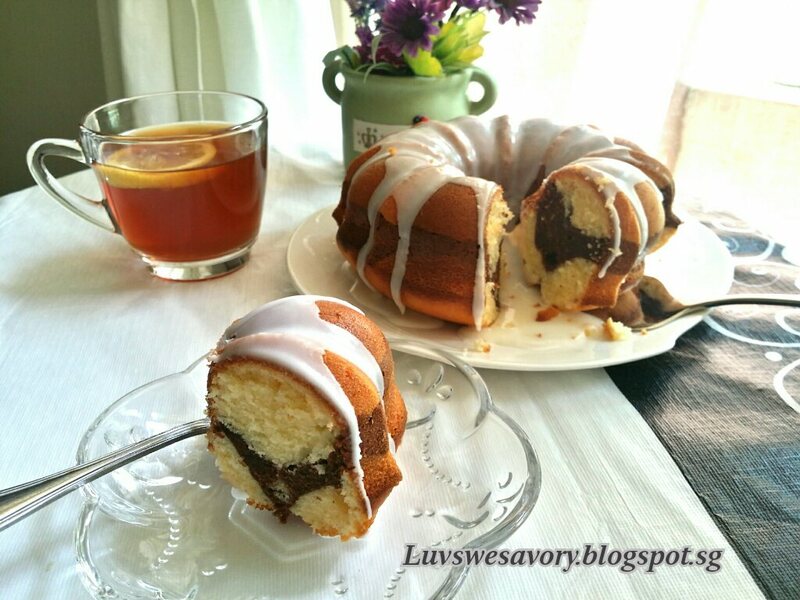 Chocolate and lemon sounds heavenly together Karen, you are the queen of delicious cakes! Lovely cake! A slice or two sounds good with warm honey lemon tea! I want! Such a pretty set up for afternoon tea or coffee. This bundt pan really bakes up beautifully! Hi Omar, thanks for dropping by and introducing the tool for generating recipe. I did tried some time ago but not used to using it. This is so beautifully made!